Green beans come in a variety of types and sizes. 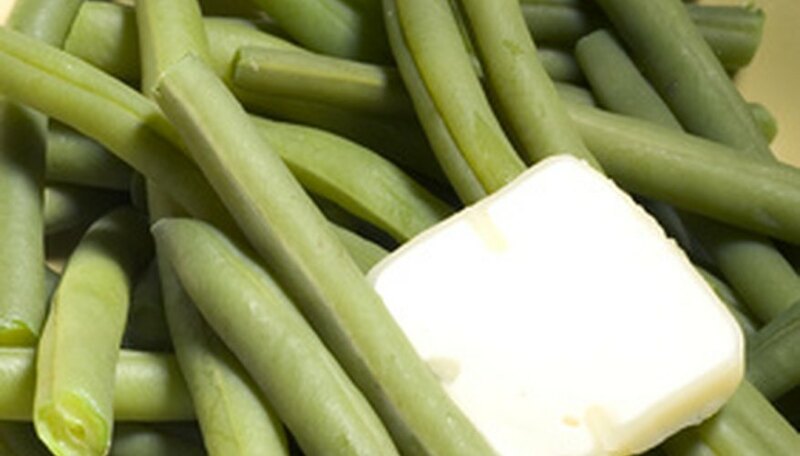 From the “Kentucky Wonder” pole bean to the small French “haricot vert,” green beans are easy to grow in home gardens and provide valuable nutrients to many different recipes. But some critters like to eat green beans just as much as humans do, so to keep the harvest to yourself you can use several methods of organic controls for the pests that compete with your for this succulent vegetable. Spray aphids and spider mites with insecticidal soap. You can purchase insecticidal soap at your garden supply store or make your own: mix 1 tablespoon of basic dish soap with 1 quart of water. You’ll know when aphids have attacked your bean plants because the leaves will curl and then turn yellow. Often, ants bring aphids to bean plants so they can dine on their sweet excretion called honeydew. If you control ants, you’ll also be controlling aphids. Smear a thick (1/2 inch) layer of Tree Tanglefoot around the stalk of each bean plant: ants cannot pass over this substance. Dust your green bean plants with Bacillus thuringiensis (Bt) to control the bean leaf beetle, Mexican bean beetle and other insects of this type. Bt is a naturally occurring soil bacterium that is also effective against caterpillars and other worms. Hand pick beetles, caterpillars, earworms and cutworms. Wear gloves and then search for these critters—dispose of them by stepping on them or squashing them between your fingers. Stop snails and slugs from eating your bean plants’ leaves and developing fruit by scattering iron phosphate granules on the soil around the base of your bean plants. Iron phosphate is a natural substance that occurs in soil. You also can hand pick snails and slugs if you search for them at night. Using a flashlight, pick them off your plants and destroy them by stepping on them. Hang “sticky traps” around the area where your green beans are growing if you have a problem with whiteflies. These insects and many other flying critters will fly right onto the yellow traps and will not be able to remove themselves after they become stuck. Ivory Liquid is a good choice for your homemade insecticidal soap. Avoid concentrated products.